Getting a bad deal on a kerosene heater can not only leave you feeling like you wasted your money but can also create dangerous situations. Many people will feel like they can’t shop for these great heating implements online, as they prioritize safety and getting a good deal. It can be hard to get a good feel for a product when you’re shopping online. If you don’t want to make the mistakes that lead to bad deals and unsafe situations, you’ve come to the right place. Our reviews are designed to evaluate each model and cut through the misleading information online to help you find the model that’s right for you. We’ve also included a buyer’s guide that walks you through some valuable safety tips, while also teaching you what you need to look for in order to get a great deal on your next purchase. 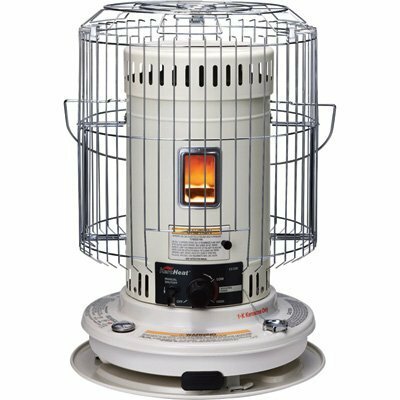 The Sengoku KeroHeat Cv-23K Indoor/Outdoor kerosene heater is the best overall choice for those who need an indoor kerosene heater. It can heat up to 1,000 square feet, which could keep a whole small apartment warm in the coldest temperatures. It also features great run time. One full tank of kerosene, or 1.9 gallons, will provide up to 12 hours of heat. That means you don’t have to refill this model very often and can experience the heat with little hassle. It comes with an automatic safety shut-off, which triggers if the heater ends up on its side. It also comes with a siphon pump, which you can use to quickly and safely refill the tank. Using the siphon also greatly reduces the chance that you accidentally spill kerosene, which can be dangerous and hard to clean up. The only problem with this model is that not all units that ship are made equally-well. Some won’t work or will have broken parts. You can always return them, but it would be better is if you didn’t deal with that hassle. 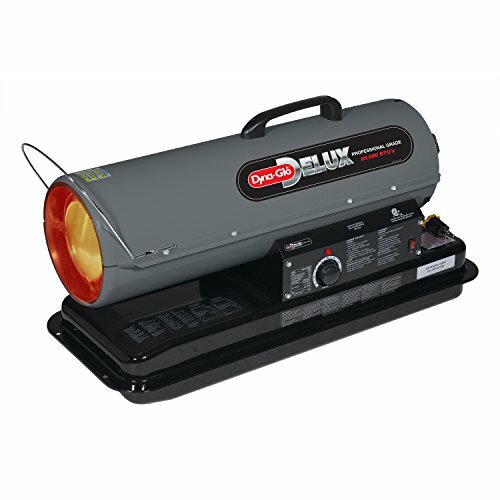 Overall, this is the best model overall for those who need a very powerful kerosene heater. The main benefit of forced air heaters is that they can heat a large space quickly in an efficient matter. The Dyna-Glo Delux KFA90DGD is the best kerosene forced air heater on the market by a wide margin. This model comes with a thermostat, allowing you to set a temperature, and this model will automatically save fuel once the room reaches the desired temperature. It can heat up to 1,900 square feet, or almost double the space that our top model can. However, it can run for up to nine hours on its five-gallon tank, giving it a respectable run time. It can also run on more than just kerosene. If you have #1 or #2 diesel, fuel oil, Jet A, or JP-8, you’ll be able to power this heater. However, it’s not the most-clean burning motor, which means you’ll need adequate ventilation where you use this model. This problem gets worse when you’re not using kerosene, which reduces its suitability for indoor use. Many users also report that multiple units sometimes leak fuel, despite working well. Still, if you’re looking for a very powerful forced air heater, this model could be the right one for you. The Sengoku KeroHeat Indoor/Outdoor CTN-110 is the little brother of the top model on our list. Since you can get it for about 33 percent less than the top model, it earns the title of best for the money. It comes with a long run time. Depending on the temperature at which you run it, you could get up to 14 hours of runtime out of this model, which is enough for an entire day’s worth of heating for most people. It also includes a siphon pump, which makes refilling easy and reduces the chances of spillage. However, this model will only work on kerosene, making it less flexible than other models on our list. That wouldn’t be enough to knock this model down to third on its own, but it also creates worse fumes than its older brother. That means you need to have good ventilation, which can be hard to have in winter. However, if you can make that happen, you can save a ton of money with this model. It heats well, and evenly, and is powerful enough to keep a large room, or multiple small ones warm in winter, and do it at a budget price. The Dr.fasting DH2304 Indoor Kerosene does something that few other kerosene heaters can get right. It works with little to no odor, and very little smoke, except for on startup and right after turning it off. That makes it one of the cleanest burning models on our list and good for people with poor ventilation or who are especially sensitive to the smell. It can also run for between 9 to 12 hours on its 1.9-gallon tank. That means you’ll only have to refill the tank one or two times every day, or less frequently if you’re not running it constantly. However, this model has poor quality control, and that leads to some common problems. A significant one is that the siphon pump often fails within a few months of purchase. The automatic ignition also tends to go out, and while there are other ways to get this model going, it’s a feature that really shouldn’t fail. That means it can be hard to light this model relative to others on our list. Overall, this model can heat a large area with little to no smoke and smell, but the parts that give out make it poor value overall. Hopefully, our reviews have helped you gain some insight into what makes for a great kerosene heater, and what features make for a model that you’re better off avoiding. Of course, you may feel like you still don’t have enough information to make a safe and well-informed decision. If you’re new to kerosene heaters, be sure to check out this buyer’s guide for some valuable safety tips. We also walk you through everything you need to know to get a great deal on your next purchase and to narrow down the models to the one that’s right for you. Using kerosene indoors comes with some inherent risks, but there are steps you can take to minimize your risk, even if you can’t eliminate all risk whatsoever. The first and most important, thing that you need to do is make sure that you use kerosene and not gasoline. Many first-time users don’t realize that there’s a large difference between these two fuels. Gasoline will burn might hotter and faster than kerosene under the same circumstances. Instead of a pleasant heat, you’re likely to get a fire or even an explosion if you use gasoline instead of kerosene, so the most important thing you can do is use the correct fuel. When it comes to kerosene, the best variety is 1-K kerosene, which has the highest quality. This kerosene burns well, providing a lot of heat, but it’s also very pure, so you get fewer dangerous emissions, and a more even burn. Many states have certification programs that guarantee that a 1-K kerosene vendor is providing kerosene that lives up to high standards. Before buying kerosene, you should find out if you live in one of those states and only buy kerosene from a certified seller. Many safety experts recommend that you only refill your kerosene lamp outside of the home. This reduces the chance of dangerous spills and accidental fires that could occur during the refill process. Kerosene heaters with siphons do a good job of further reducing this risk. While some kerosene heaters burn more cleanly than others, all heaters produce some levels of harmful gasses. Carbon monoxide and nitrogen oxide are two of the most commonly produced poisons. While they are normally produced in quantities that are too low to affect most people, some people with chronic respiratory or circulatory problems. It’s a good idea to install extra smoke detectors and carbon monoxide detectors on the floors on which you’ll use your kerosene heaters. That way, you’ll have advance warning if something starts to go wrong. A good way to reduce the pollutants that your heater puts out is to make sure that it’s properly maintained. The manual included in your purchase will cover the ways in which you can keep your heater in good condition. Maintaining the wick, in particular, is important towards reducing dangerous gasses. It’s also important to make sure that the room in question has good circulation. Experts recommend keeping at least one door to the rest of your house open while your heater is in operation. If you can’t keep a door open, crack a window a few inches so that fresh air can enter the room and dilute the dangerous gasses. You should never use a kerosene heater in a sealed room, as it burns up oxygen while it works and could lead to the asphyxiation of anyone who is inside with it. If a flare-up or fire begins, it’s important that you don’t move your heater. First, you run the risk burns if you grab onto it. Second, you can drop it and make the situation far worse. Instead, you should focus on turning down the dial that controls the flow of the kerosene to the wick. You stand a chance of stopping the flare up or fire by starving it of its fuel at this stage. You should also take steps to reduce the number of flammable materials that are around the heater. It should be at least three feet away from furniture and other combustible materials, and it should be placed so that it’s not exposed to a lot of foot traffic, and is out of the reach of children and pets. Some models also come with automatic features that protect against accidents. The most important of these is an automatic auto-off feature. This will shut the kerosene heater down if it ends up on its side, and goes a long way towards preventing fires in your home. One of the most important features, after safety, is the area which your heater can reliably heat. How powerful of a kerosene heater you’ll need depends largely on the area which you want to heat. If you live in a smaller home or an apartment, there’s a chance that you can heat your whole unit with a single kerosene heater. 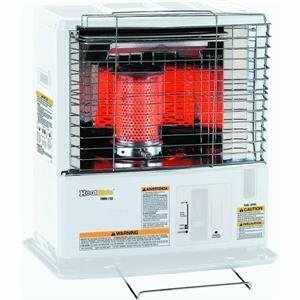 The largest kerosene heaters can heat 2000 square feet or more, giving you the power you need to heat very large areas with just one heater. The best models for heating large areas are forced air heaters. These models actively force air through them, letting them more air faster than other models. These are often tied into the home’s full air conditioning and heating system, but some are standalone models. Radiant models simply heat the air around them and don’t actively move it, which means they’re slower and affect a smaller area than forced air heaters. A third kind is convective models, which are designed to quickly warm and lift air, though they don’t actively move it. Since they move air more than radiant models, they can heat a far larger area than those heaters, but they don’t work as well as forced air models. As with most tools, the more power that you get out of it, the less efficient it will be. Generally speaking, heaters follow the same power. More powerful heaters use more kerosene, though they still generally have good run times without refilling because they feature larger kerosene tanks. Some models can run on fuels that aren’t kerosene. Of course, these generally don’t burn as cleanly, and in many cases, don’t burn as efficiently as well, but it can be useful to have the option to burn different fuels. In some cases, the alternative fuels may be far cheaper in your area than kerosene is. Radiant heaters tend to be more fuel efficient than the other two types when it comes to fuel consumption, but they also heat the smallest area and in the slowest manner. However, if you’re only looking to heat a single room, a small radiant kerosene heater will be the most cost-effective purchase over time. Forced air kerosene heaters will heat the largest area, but they can be very fuel-greedy and can cost a lot to operate in the long run. There are a few extra features that can add a lot to your experience without costing far more. The most useful of these is easily the battery-powered starter. Relying on batteries, usually of the “C” or “D” variety, these models can produce a small flame to get the heater going at the press of a button. That way, you don’t have to use a lighter or match to get the heater going, which is convenient, and greatly reduces the chance of accidents. Safety cages are another feature that can save you a lot of trouble. They come on most, but not all, modern models, and serve to keep people from accidentally burning themselves. The safety cage extends far out from the side of the heater and is usually made of thin metal bars that allow air to circulate freely, but make it hard to accidentally touch the heater’s surface, which can get extremely hot. 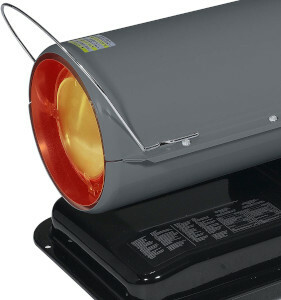 Which kerosene heater is right for you? Many people think about value as though it involves spending as much or as little as possible. However, value is about more than the money you spend. It’s also about how useful your investment is, and how much you ultimately enjoy using it. While it may feel like it’s hard to determine these things from product descriptions alone, there are steps you can take to improve your selection process. First, you should figure out what you need from your heater. The space you need to heat is the most important feature, while the efficiency and other features are things you should consider as well. Once you’ve figured out what your needs are, make a list of all heaters that would cover your needs. Then, you can safely order the cheapest model on that list. Since it’s the least expensive, it will provide the best value, and since you’ve already presorted out any models that won’t suit your needs, you’ll get a model that you’ll be satisfied with. 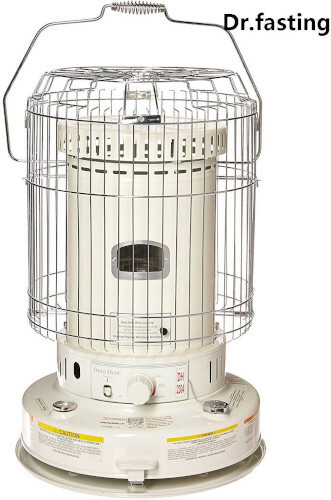 The Sengoku KeroHeat Cv-23K Indoor/Outdoor kerosene heater is the best choice for indoor kerosene use, due to its large heating area, good run time, and automatic shut-off. The Dyna-Glo Delux KFA90DGD is the best forced air kerosene heater, and includes a thermostat, a good runtime, and can run on multiple fuel types, though its relatively dirty burning keeps it out of first place. The Sengoku KeroHeat Indoor/Outdoor CTN-110 comes with a long run time, a great price and includes a siphon pump, and given its low price, it’s the best overall for the money. The Dr.fasting DH2304 Indoor Kerosene has a good run time and little smell, but poor quality control drops this model to last place on our list. We hope that our reviews and buyers’ guide have helped you understand kerosene heaters and proper safety steps. With that information, you should be able to find a model you’ll love using, at a price your wallet will love, too. What to look for in a heater for your bathroom?